In the era of Internet Marketing and "reaching the masses" - I decided to jump on the ol' bandwagon & attempt marketing through a well known site You Tube. Being the online leader in video broadcasting, You Tube has millions of viewers world wide... and is free. It only made sense to put together a marketing piece in order to tap into resource and hopefully potential customers. 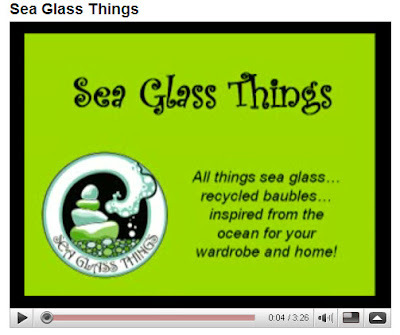 Check out Sea Glass Things video now on You Tube! I used Microsoft Power Point to put my slides together. I arranged the layout, timing and transition of the slides. I also added audio. Now the tricky part was converting the Power Point to a video stream suitable for broadcast. Through a lot of searching and trial & error I came across ABOILSOFT. I was able to download and utilize a trial version of the software and convert it to a .avi file. Though it may not be the best product out there, and the audio isn't as crisp as I would have liked - it seemed the most user friendly. So check it out - reach the masses and broadcast yourself today! Hey Marla, what a great idea, it never occured to me to use You Tube for my business. . . now I need to think of something! Thanks for sharing.